Fresh from the mailbox comes this dreadful Faces of Death rip-off. The clips are tepid stock footage that could play on daytime History Channel nowadays with unintentionally stupid narration. The only thing notable is the cover which is the size of a Thorn EMI hard case for clamshell hounds (like myself). 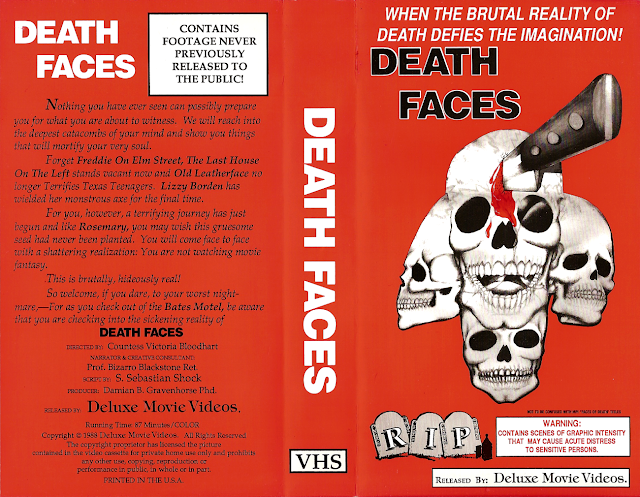 The cassette and shockumentary itself has "Death Faces IV" as the title. To date, this is the sole installment...thankfully. Am I reading the back correctly when it says that it was directed by a Countess?!? Sweet clamshell.